These gorgeous paring chisels are new from Blue Spruce in the USA. 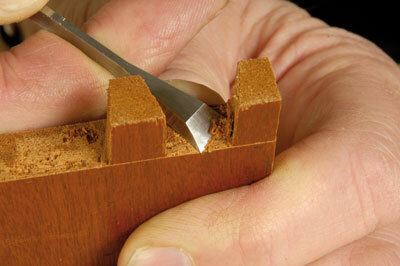 The UK supplier is Classic Hand Tools. I had them on test for a week and one of my students has already gone out and bought a set! Now I accept that you might get similar results from old cast steel hand-tuned chisels that have been totally re-fettled and re-handled, but these tools do induce a certain precision factor in the user. They are finished almost as items of jewellery would be finished, and that encourages the owner to aim that little bit higher in their use. The name behind the Blue Spruce company is Dave Jeske, a mechanical engineer with experience in advanced materials, precision machine design, lean manufacturing processes, and business management. He is a self-taught woodworker with a passion for hand tools. Many of the tools he uses are from the 1800s including his favourite dovetail and small tenon saws, plus many moulding planes. Dave started by making marking knives, using his understanding of advanced steels and production, and has now moved onto chisel manufacture. 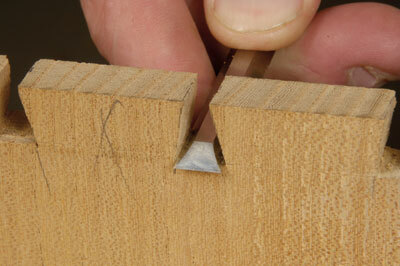 I tried out a fishtail paring chisel and a long paring chisel. The shafts are thin and have been hollow-ground along their length in order to give them more accessibility in tight places - they are therefore ideal for cleaning up joints to a very high standard. This thin section does mean that the shafts flex slightly, but these are chisels that are not intended for heavy use. They should be reserved for the final, precision, finishing-off cuts. The blades are A2 steel, hardened to Rockwell 60, which gives a razor sharp edge. The chisels are available with different timbers for handles and with larger handles for those that want them: cocobolo, African blackwood and curly maple. The different timbers make identification in the tool roll just that little bit easier. At present, the long paring chisels are only available as a set, but in the future it is hoped that they will be purchasable individually. 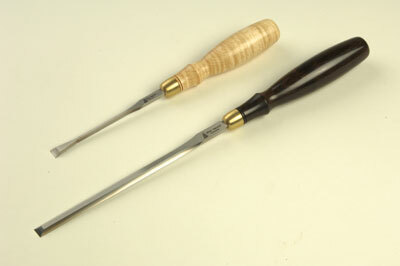 The fishtail chisels can be purchased individually and vary in price in accordance to choice of handle. In the case of these tools, the oft quoted adage that old cast steel is better than new steel does not seem to be true. I unhesitatingly recommend these chisels and I am sure that the other chisels in their range are as good to use. I cannot wait to try out some more Blue Spruce chisels! "I unhesitatingly recommend these chisels"